The EPS team exhibited at HITEC at the RAI convention centre in Amsterdam on 12th/13thApril. HITEC is the annual Finance & Technology conference & exhibition for the Hospitality sector in Europe. 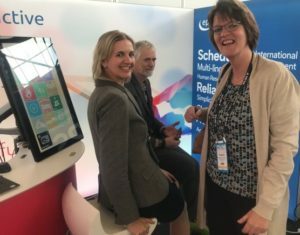 With a variety of hotel operators and technologists visiting our stand, Eproductive’s CEO Chris Cowls said ‘ It’s always good to meet new people in our sector as well as catch up with old friends again. We are delighted that HITEC is being held in Amsterdam where we already have EPS installed successfully in 8 hotels operated by 3 different clients’. Eproductive’s Nancy Weatherson with Hannita van Houweling of Eden Hotels and Martin Vrijenhoef of Bilderberg Hotels.